‘What is a Poet?’, Wordsworth asks in the Preface to the 1802 edition of Lyrical Ballads, the capital falling inevitably into place. His answer has become to a large extent a critical truism, but looking at accounts of the other poets working contemporaneously with his early career helps to make clear how strange it must have seemed to many at the time. 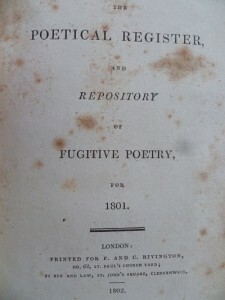 Neither Davenport nor the poetry and criticism in the Poetical Register, interesting as these are, form the principal subject of this particular post. Instead, I want to examine a fairly minor feature of the volume: the five-page ‘Chronological List of Living Poetical Writers’ which forms the second of three entries in its final section, ‘Miscellanies’. Before discussing the evidence, it is first necessary to submit it for examination. The original volume, including the list, is available in its entirety on Google Books, but for convenience, I’ve given an edited version on a separate page of the Romantic Textualities site which identifies many of the more obscure poets and provides biographical information. As slips in the list’s typography imply, it can by no means be taken as wholly authoritative. The missing dates for Sir James Marriott and Dr Scott would seem to indicate that its compositor changed his mind about how to display the dates during the typesetting process, having originally planned only to include the years for the first poet who published in each, rather than for each individual. Hector Macneill looks to have been added as an afterthought. Cross-checking with other sources reveals that the last few poets listed as having first published in 1781 actually published their books in 1782, so it’s possible that the hand the typesetter was working from was less than ideal. This hypothesis could be supported by number of other small errors (‘Robert Pratt’ for ‘Samuel Jackson Pratt’, ‘John Holden Pott’ for ‘Joseph Holden Pott’, ‘J. T. Mathias’ for ‘T. J. Mathias’ and so forth). A cursory examination would seem to indicate that the list is relatively complete, although there are certainly omissions. For example, Thomas Moore, who published his Odes of Anacreon in 1800, fails to make it on, despite the appearance of a number of other poets who principally translated or adapted classical works. As mentioned, the dates the list supplies are not infallible; for Wordsworth, it neglects An Evening Walk and Descriptive Sketches, both published in 1793 and acknowledged as being by ‘W. Wordsworth, B.A. Of St. John’s, Cambridge’, as well as the first (anonymous) edition of Lyrical Ballads. However, most of the major figures we would expect to be on such a list are present, along with a host of others less familiar or less well-known for their having written poetry. One thing that’s particularly striking about the list is how many of the male poets are identified as professionals or men of substance in fields independent of literature. There are twenty-eight Reverends on the list, as well as Thomas Percy, Bishop of Dromore, who, based on the dates, was seemingly included for compiling the Reliques of Ancient English Poetry (1765). In addition, there are several clergyman denoted D.D (John Ogilvie, John Delap, Thomas Coombe, Luke Booker) and some further divines, like James Scott (Anti-Sejanus), marked as doctors. The total number – around a third of the overall total – attests to the importance of the church as a sanctuary for poets, or perhaps to the usefulness of a little poetic talent for drawing the notice of those able to provide one with preferment. If Coleridge had joined the Unitarian ministry, or if Southey had followed his uncle’s wishes and joined the established church, then they would have been following an established pattern for the sorts of men who wrote verse. Similarly, the list includes nine men identified as MPs, five with the postnomials of medical doctors and two identified as barristers. It also features a knight, two baronets and an Earl (Frederick Howard, the fifth Earl of Carlisle, Byron’s guardian and one of his victims in English Bards and Scotch Reviewers). 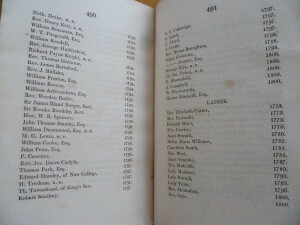 Several men are marked out by their affiliations with institutions – William Gifford with Exeter College, Edward Hamley with New College and Thomas Townshed with Gray’s Inn. The list also includes a Royal Academician and a Fellow of the Royal Society of Edinburgh. This list, then, is one which marks out poetry as a form written by men who also do other things: not pure ‘Poets’ in a Wordsworthian sense, but individuals for whom poetry was something closer to a helpful accomplishment. Seeing poetry in this way helps to make sense of figures on the list whose names are familiar but who we would associate with other fields. For example, Richard Brinsley Sheridan, Arthur Murphy, Richard Cumberland and Robert Jephson would generally be identified in a literary sense principally as dramatists, although Sheridan also enjoys a level of enduring fame for his political career. A bit of digging makes clear that the vast majority of the men on this list were not wholly absorbed in literature, but were either gentlemen of means or pursued professional careers of various sorts. John Hoole and Eyles Irwin worked for the East India Company, Thomas Maurice for the British Museum. In addition to his church posts, Edmund Cartwright invented the power loom and was known for his agricultural experiments. For him, as for many others among the men listed, poetry was essentially a second- or third-string occupation, not precisely a hobby, but maybe closer to that than to a Wordsworthian vocation. 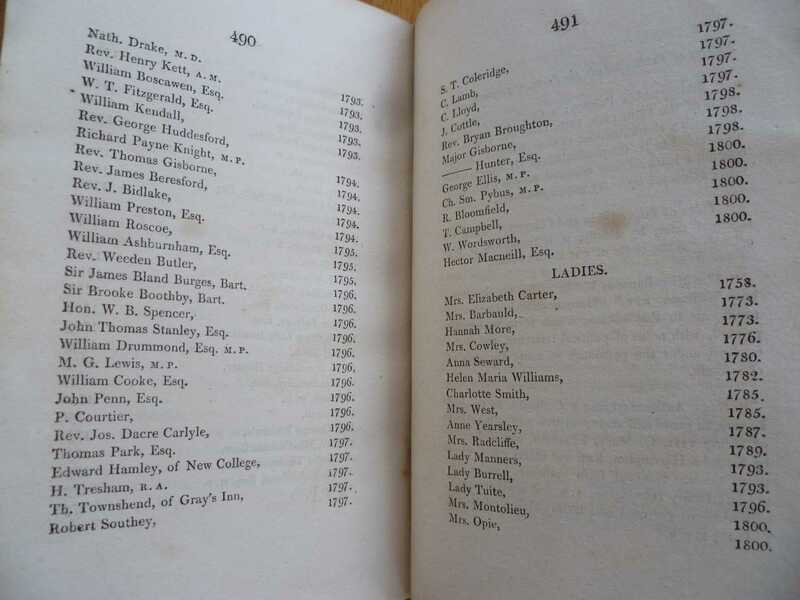 Turning to the fifteen women on the list, we find a group of names which are in large part rather more familiar than those of the men, attesting to the effectiveness of the scholarly recoveries of the works of female writers over the past thirty or so years. With the fifteen ladies, though, we do not find the professional trappings associated with the male names. There are three aristocrats (incidentally, these three are among the five or so least familiar names of the fifteen), but apart from these individuals, the women are either identified as ‘Mrs. X’ or purely by their names. In some ways, this might be seen as reflecting the limited professional roles available to women in society. However, it might also indicate their ability to be in some ways more purely poets than their male counterparts, identified solely with their writings. If accurate, this might help to explain some of the Romantics’ attitudes to the women poets who were perhaps their immediate precursors in being seen as having made themselves solely through verse. While many male poets approached verse as something functional – as a means of getting themselves noticed, expressing piety, demonstrating taste or making a point – for Wordsworth, writing was both a means and an end. In his expressions of this conviction, his inevitably masculine poet uneasily overwrites previously feminine poetic formulations (as Elizabeth Fay argues with respect to ‘Della Cruscan effeminacy’). Byron takes a slightly different approach in his lines on authors in Beppo, arguing that the best writers are ‘Men of the world, who know the world like men […] Who think of something else besides the pen’. Steeped in an Augustan tradition reflected strongly in the Poetical Register’s list, Byron attempts to reassert the poet (and by extension, himself) as a man of many qualifications, an assertion the list is also keen to make. Both Wordsworth’s having to assert new, more demanding definitions of poetry in 1800 and 1802 and Byron’s harking back to older models in 1817 seem to indicate that some quite fundamental shifts were occurring in the first couple of decades of the nineteenth century with regard to the general conception of the nature of the poet. Sadly, the final, 1810–11, volume of the Poetical Register does not include a similar list, but it would be interesting to look for other directories in order to trace how these changes manifested when poets were organised and represented en masse. I’ve rambled on here for too long, so I’ll pick up some of these points in a future post, looking more at some of the figures on the list and exploring the Poetical Register further. In the meantime, I’d be very grateful for any feedback on the list – the names of figures missing, notes about the more obscure writers and any suggestions for interpretations.